I find it interesting that if you go to the Esteban Carreras website you get a bunch of high profile cigar names thrown about except a description of the person that your company and cigar is named for. What it will tell you is that the El Paraiso factory in Danli, Honduras where some of their cigars are manufactured is owned by Nestor Plasentia and managed by Rocky Patel, Jesus Fuego, Conrado Plasentia and Craig Cunningham. Craig Cunningham is the president and CEO of Esteban Carreras Cigar Co. Who Esteban Carreras is or what the significance of the year 1961 is, does not seem important enough to warrant an explanation on their website. They would much rather tell you that this cigar is rolled and blended in the La Aurora Factory in Santiago, Dominican Republic where Guillermo Leon Jimenez is executive V.P. and Jose Blanco is sales director. Now that you are as thoroughly impressed as I am (reeking of sarcasm), let's get on with the review. The cigar blend contains tobaccos which I personally adore: a long aged Cameroon wrapper, an Ecuadorian Sumatra seed binder and a filler blend of tobaccos from Nicaragua, the Dominican Republic and San Andres. The corona vitola is 5 and 1/2 by 42 ring gauge and costs about $6.50 a single. 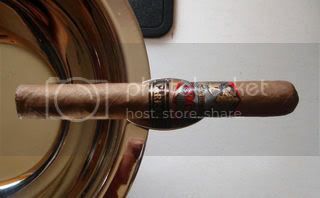 The cigar is medium brown in color, with a slight oily sheen and bumpy appearance. The wrapper is nice and tight and comes with a rounded layered cap. You will find that the cigars are nicely packed with enough room to allow for a pleasant draw. The cigar gives off an earthy aroma with a touch of fruitiness at the foot. Pre-light draw flavors give me the "all too generic" prune taste. This corona is easy to light and burns fairly evenly producing a firm light gray ash. It's medium bodied and medium flavored and should be easily tolerated by all levels of smokers. The initial flavors are sharp yet enjoyable. You get notes of vanilla, dark coffee, cinnamon and a touch of sweetness on the finish. Eventually some spiciness begins to develop at the one inch mark. The second third of the cigar stays pretty consistent and one-dimensional but I do notice a slight bitterness coming through but certainly not over the top. I can also taste some leather and a dry tobacco flavor. The final third of the cigar adds some nice nutty flavors to the mix, all the while maintaining some spiciness in the background. Overall, I would say that this is a mediocre smoke. The cigar is pleasant tasting to smoke to the nub. However, I wouldn't say that this cigar was to the level of a Bolivar petit corona (Cuba) in taste or even better than a Carlos Torano 1916 Cameroon corona. Considering all the high profile names associated with this cigar, I would say that it was disappointingly average at best. And with the market so full of many choices out there, who wants to settle for average.